This is not the kind backpack that anyone is going to travel world with, but it could be worth taking along on business trips for occasional use. 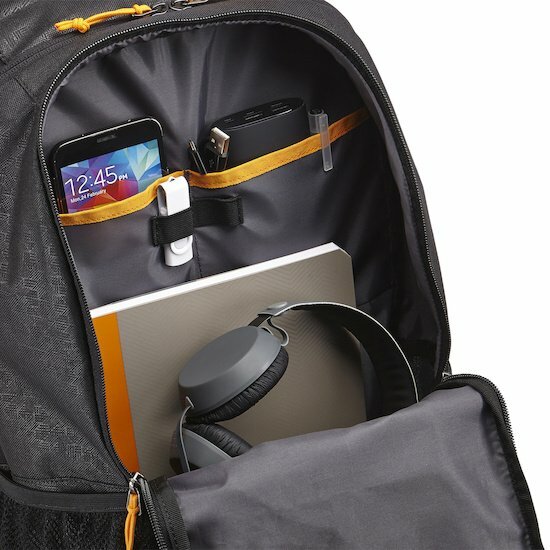 Designed to take the 15.6 inch laptop as well as a 10.1 inch tablet, the Ibira tries to plug the gap between high-end, hard-wearing day packs designed for multiple gadgets, and the all-round college/conference bag. Weighing about half a kilo, the lightweight Ibira has three separate sections. The main section can take a laptop on the back section and a tablet in the front, with room in between for other files and folders. However, those two compartments are rather flimsy, and do tend to slope inwards when the respective gadgets are in-situ. Another section at the front of the bag boasts two smartphone-sized sections, one of which could take a pair of rolled up earphones, as well as two elastic pen slots. There is another stash pocket on the front, as well as two elasticated netting pockets on each side for taking a water bottle or two. So far, so predictable, but the Ibira does have one secret its sleeve on the reverse, padded side, which happens to be bright orange for no apparent reason. Hidden below an elastic strip is a secret pocket that sits against the small of the back. It’s ideally-sized to take a smartphone, a passport and/or cash. That’s a great feature that lends some quality to an otherwise decent value attempt at a day sack that just falls short on quality materials. However, its lightweight, easily collapsible design could make it a convenient solution for business trips to conferences or lectures.